FROBISHER, SIR MARTIN, mariner, privateer, explorer, the first Englishman after the Cabots to seek a northwest passage; b. 1539? ; d. 1594. He was one of five children of Bernard Frobisher and his wife, the daughter of a knightly family named York. When Martin was of an age to be schooled, his widowed mother put him in the care of her brother, Sir John York, then master of the Mint and resident in London. 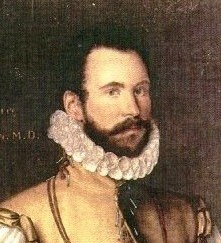 The extant personal papers of Frobisher suggest that he leaned little towards scholarly pursuits, as lad or man; but as Lok says in his account of the first voyage, his uncle perceived him “to be of great spirit and bould courage, and naturall hardnes of body.” In 1553, Sir John sent Martin to Guinea with the Wyndham expedition, in which Sir John had invested; Martin was among the quarter of the expedition who survived, In 1554, he joined another trading expedition to Guinea; on this venture he was detained some months by an African chief as a hostage. No contemporary document dates the year in which Frobisher’s seaman-venturer’s imagination began to work on opening a route west across the northern seas between Elizabeth’s England, feverish for gold, and Cathay, treasure house of the known world. At his uncle’s house, even before being sent to sea, young Frobisher would have heard constant talk of the wealth of the Orient and of routes to it. Likely enough, coming from such a household, his ears and fancy were pricked by the tales of a captain on the Wyndham expedition, one Pinteado, who declared that such a passage not only existed but that Pinteado himself had earlier passed “this streicte.” By 1561 Frobisher had laid before his friends a map by which he proved a northwest passage voyage “easie to bée performed” (G. Best, “The fyrst booke of the first voyage of Martin Frobisher . . .”). For 15 years thereafter he offered his services for such a voyage to likely entrepreneurs of the time. Unable to promise them “sure, certayne, and present gaynes,” he despaired of opening their purses and took his plan to the queen’s court. 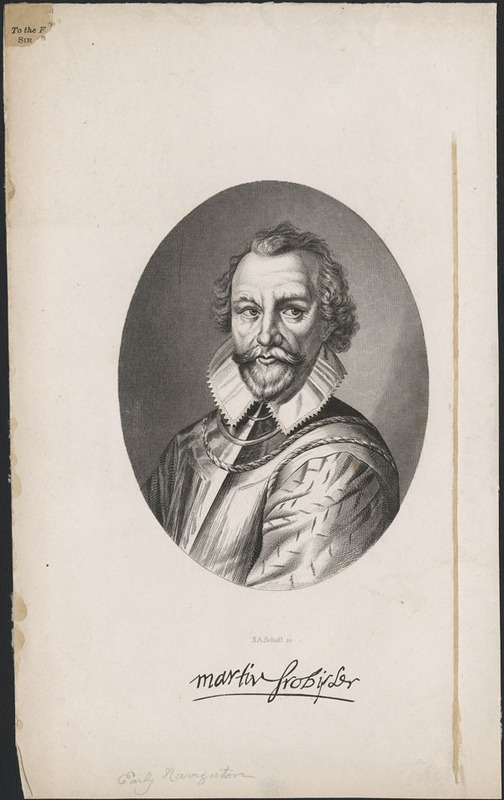 Ambrose Dudley, Earl of Warwick, brought Frobisher to the favourable attention of members of the Privy Council who, in December 1574, recommended to the Muscovy Company that it grant him a licence for a northwest exploration. When the Muscovy Company, itself under licence from the Privy Council to search out a northwest passage, refused to support Frobisher, the Council ordered the company either to attempt the exploration by an expedition of their own or to grant a licence to someone who would attempt it. Michael Lok, the director of the Muscovy Company, had meantime become enthusiastic about Frobisher’s proposal; he persuaded the company to grant Frobisher a licence for north-west passage exploration without further opposition. From 18 of many persons solicited, Lok and Frobisher were able to raise £875. Lok agreed to assume the remaining cost, more than £700. They built a ship of about 20 tons, the Gabriell, and bought the Michaell, a ship of about 25 tons, and a pinnace of about 10 tons. Dr John Dee, Elizabethan England’s most famed astrologer, mathematician, and sometime magician passed the spring of 1576 on board Frobisher’s ships, instructing the men in the new art of cosmological and mathematical navigation. On 7 June 1576, the fleet, with Frobisher its admiral and pilot, sailed from Ratcliffe. Christopher Hall was captain of the Gabriell, Owen Griffyn of the Michaell; the crews numbered in all, 35. The queen herself waved them farewell as they passed Greenwich. On 26 June, having been delayed by wind, they reached the Shetland Islands, then sailed westward. On 1 July, Frobisher sighted the east coast of Greenland; this he took to be Friesland, an island then charted on most maps of the North Atlantic Ocean, but now known not to exist. [See Appendix for a discussion of the Zeno brothers’ map.] Ice and fog along the coast prevented a landing. While they were near Greenland, a great storm arose in which the pinnace and its crew of four were lost, the Gabriell nearly swamped, and the Michaell separated from the Gabriell. Capt. Griffyn of the Michaell was so frightened by the ice encountered that he decided to turn back. When he arrived in London, he reported the rest of the expedition lost. 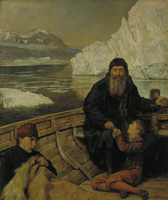 Undaunted by the loss of his sister ship and pinnace, Frobisher continued westward “knowing that the Sea at length must néedes have an endyng, and that some lande shoulde have a beginning that way.” On 28 July he sighted a coast (probably Resolution Island) that he named Queen Elizabeth’s Foreland. Directly north of it he discovered a “greate gutte, bay or passage,” dividing, or so he thought, Asia on the north from America on the south. He sailed some 60 leagues into the passage which, following the precedent of Magellan, he named for himself – Frobisher’s Strait. The “strait” is in fact the deep bay in Baffin Island that still bears Frobisher’s name. 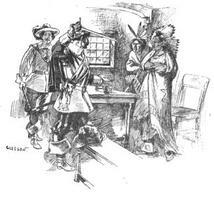 In late August, natives came to the ship to trade meat and furs for trinkets and clothing. One native agreed, by signs, to pilot the ship into the “West Sea.” Frobisher sent the native, accompanied by seamen, back to shore to prepare himself for the journey. Contrary to Frobisher’s orders, the five men who rowed the native ashore landed out of sight of the ship. Two of the five rowed into sight again, but then headed back to shore, and none of the five was ever seen again. Frobisher, hoping they would return, stood by for three days; he then proceeded along the coast with the plan of capturing other natives whom he might ransom for his own men. He found no other natives and when he returned to the place where his men had disappeared he found the natives who had been there gone. In despair, he decided he must return home. Just before leaving Frobisher’s “strait,” he captured a native who had come to the ship in his kayak to trade and took him to England. The Gabriell’s arrival in London, on 9 October, was greeted with joy and admiration, not only because the ship had been supposed lost, but also, as Lok said, because of the “strange man and his bote, which was such a wonder onto the whole city and to the rest of the realm that heard of yt as seemed never to have happened the like great matter to any man’s knowledge.” Frobisher was “highly commended . . . for the great hope he brought of the passage to Cataya” (Best) but his prisoner, who had taken a cold at sea, soon died. The rumour of gold made the supporters of the first voyage eager to join in financing a second. In March 1577 they formed the Cathay Company, under royal charter; Lok was appointed governor and Frobisher styled “high admiral.” Queen Elizabeth subscribed £1,000 to the new company and lent a ship of 200 tons, the Ayde. Frobisher’s commission for his second voyage, according to Best, “directed hym . . . only for the searching of the Gold Ore, and to deferre the further discoverie of the passage untill another tyme.” On 31 May 1577, Frobisher set out from Harwich with 3 ships and about 120 men. 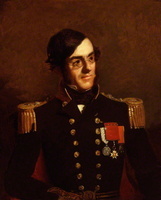 He, his lieutenant, George Best, with Charles Jackman as mate, sailed in the Ayde; Edward Fenton captained the Gabrielle, and Gilbert Yorke the Michaell. They were off Greenland on 4 July, but ice prevented a landing. On 17 July they reached the island from which the marcasite had been taken but, finding the ore body meagre, Frobisher moved to another island in his “strait” for mining. While the five miners and other members of the expedition loaded the Ayde with about 200 tons of ore, Frobisher searched for his lost men. No trace of them was found. Before they left the mine, on 23 August, Frobisher took prisoner a native man and a woman with a child, all of whom died about a month after they reached England. During the winter of 1577–78, disagreements, both among the investors of the Cathay Company and among the refiners, arose over the smelting of the ore. The disagreements terminated when the refiners declared the ore poor and the Company decided upon a third, more ambitious voyage. On 31 May 1578, Frobisher, in the Ayde, led a fleet of 15 vessels from Harwich with the double object of establishing a settlement in Frobisher’s “straits” and of bringing back to England 2,000 tons of ore.
On 20 June, Frobisher took possession of Greenland (he still thought it Friesland) in the name of Queen Elizabeth and renamed it West England. On 2 July the expedition sighted the new land – Meta Incognita, Queen Elizabeth had named it – but ice and unfavourable winds prevented their landing immediately. Driven south, they sailed some 60 leagues into a “mistaken straytes.” Frobisher consulted with his subordinates, especially with James Beare, a master in the fleet who had made a chart of the coast in 1577, and Christopher Hall, his chief pilot. At first Frobisher insisted, against Hall’s opinion, that it was “Frobisher’s strait.” He explained later that he had hoped, by maintaining the newly discovered strait was his own, to follow it to China. A quarter of a century elapsed before George Waymouth, in 1602, and Henry Hudson, in 1610, demonstrated that the “mistaken straytes” led not into the South or West Sea, as Frobisher believed, but into the inland sea now called Hudson Bay. At the end of August, the 13 vessels left the Countess of Warwick’s Sound with their cargo of ore. In England, attempts to refine gold from the ore continued at least until 1583; finally both refiners and investors admitted failure. Many of the documents relating to the organization and the financing of Frobisher’s three arctic voyages have been preserved in the records of the litigations following on the failure of the Cathay Company. Had the voyages turned out more favourably to the investors, the company’s earlier records would probably by now have been lost or destroyed. Frobisher continued in naval service after the failure of the Cathay Company. In the autumn of 1578 he participated in a campaign to put down a rebellion in Ireland. In 1582 he planned – but never made – an expedition to Cathay by way of the Cape of Good Hope. 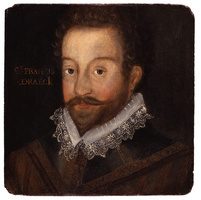 In 1585 Sir Francis Drake, with Frobisher as vice-admiral, led a privateering expedition of 25 vessels to the West Indies; the fleet returned to England in July 1586, having done great damage to the Spanish settlements and taken a booty of £60,000. In 1588 Frobisher held one of the chief commands in the naval defence of England against the Spanish Armada; for this service he was knighted. In the spring of 1589, Sir Martin assisted Drake in harassing Spanish shipping, an activity he continued, in positions of command, until 1594. In that year the Spanish king sent a force to Brest to assist a faction warring against the king of France. Elizabeth sent a force to support the French. In the course of storming a fort held by the Spanish at Crozon, Sir Martin was shot in the side. 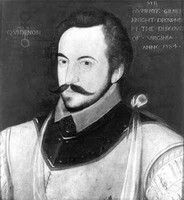 He died of his wound a few days later, on 22 Nov. 1594, at Plymouth. Little is known of Frobisher’s personal life. His first wife, Isabel, evidently died some time after his third arctic voyage; by 1591, he had married Dorothy, the widow of Sir William Widmerpole. He had no children, but named as heir his nephew Peter Frobisher. George Best, A true discourse of the late voyages of discoverie, for the finding of a passage to Cathaya, by the northweast, under the conduct of Martin Frobisher generall . . . (London, 1578); reprinted in Stefansson ed. (infra), I, in Hakluyt, Principal navigations, VII (1903–5), and in Collinson ed. (infra). Thomas Ellis, A true report of the third and last voyage into Meta incognita: atchieved by the worthie capteine, M. Martine Frobisher, esquire, Anno. 1578 (London, 1578), reprinted in Stefansson ed., II, and in Collinson ed. Dionyse Settle, A true reporte of the laste voyage into the west and northwest regions, &c. 1577. worthily atchieved by Capteine Frobisher of the sayde voyage the first finder and generall (London, 1577); reprinted in Stefansson ed., II. 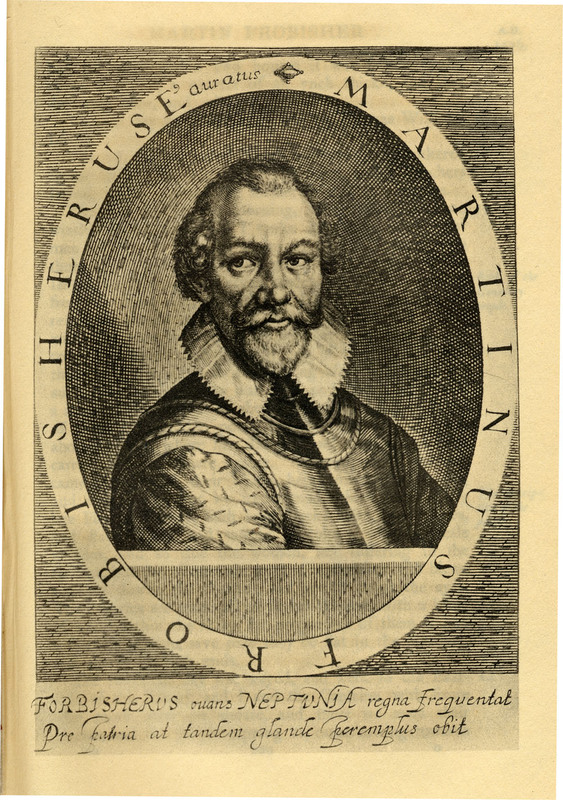 The three voyages of Martin Frobisher in search of a passage to Cathaia and India by the north-west, A.D. 1576–8, ed. R. Collinson (Hakluyt Soc., 1st ser., XXXVIII, 1867). The three voyages of Martin Frobisher in search of a passage to Cathay and India by the north-west, A.D. 1576–8: from the original 1578 text of George Best, ed. Vilhjalmur Stefansson (2v., London, 1938); all quotations in the text above are from this edition. DNB. William McFee, The life of Sir Martin Frobisher (New York and London, 1928). Oleson, Early voyages, 148–54. Sharat K. Roy, The history and petrography of Frobisher’s “Gold Ore,” Field Museum of Nat. Hist. Pub., 384, Geol. ser., VII (1937), 21–38. E. G. R. Taylor, Tudor geography, 1485–1583 (London, 1930). Alan Cooke, “FROBISHER, SIR MARTIN,” in Dictionary of Canadian Biography, vol. 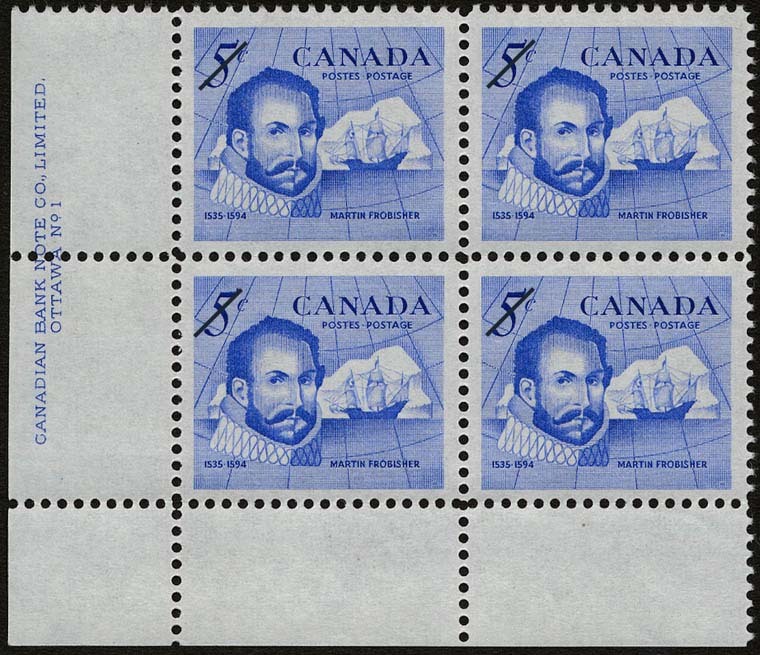 1, University of Toronto/Université Laval, 2003–, accessed April 24, 2019, http://www.biographi.ca/en/bio/frobisher_martin_1E.html.